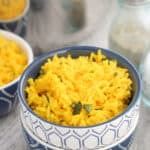 This turmeric coconut basmati rice is a flavorful rice side dish recipe that’s easy to make! Garlic, ginger, and onion are sautéed and cooked with basmati rice and turmeric in a coconut milk/water mixture for a creamy dish, and topped with chopped fresh basil for serving. In a medium saucepan, heat olive oil over medium heat. Add diced onion, minced garlic, grated ginger, and salt and stir. Cook for about 5-7 minutes, occasionally stirring, or until onions have become golden and soft, but haven't yet browned. Add the rice and turmeric to the saucepan and stir until evenly combined. Let rice cook for just a few minutes, stirring frequently, and then add coconut milk and water. Stir to combine, and then raise heat to let liquid come to a boil. Once boiling, reduce the heat to the lowest setting and cover the saucepan. Let rice cook for about 15-18 minutes, or until all of the liquid has been absorbed. Fluff the rice with a fork and stir in chopped fresh basil for serving. Rinsing the basmati rice before cooking it helps it fluff up while cooking. You can use regular coconut milk and not lite if you prefer.